There's no shortage of big-screen laptops these days. With the advent of the 16:9 aspect ratio, a screen format that widens the horizontal view while narrowing it from top to bottom, laptop screen sizes are filling in the gaps left by the current 16:10 formats. The HP Pavilion dv7t (2043CL) ($1,000 street) is a fantastic yet affordable big-screen media center, and instead of a traditional 17-inch (16:10) widescreen, it has a wider 17.3-inch (16:9) one. Overall, the multimedia experience will leave you starry-eyed, and this configuration is available for under $1,000 at your local Costco or online at www.costco.com. The HP Pavilion dv7t (2043CL)'s big screen and terrific gaming performance can be yours for just a grand. If you can overlook those little problems, the dv7t is a handsome, fast unit. For our review it was nicely configured with a 400GB hard drive, a Blu-ray drive, and Windows Vista Home Premium. And if you're looking to replace a desktop, it's a better candidate than most other big notebooks because of its proprietary left-side connection for HP's xb3000 expansion base. Though the base is an expensive add-on, it incorporates a screen stand, a third hard-drive bay, far better speakers, and a wireless keyboard and mouse for a complete desktop experience. Forget the peripherals right now, though. Without the docking station, the dv7t slightly stumbles as an end-all, be-all entertainment unit. If you're looking for the whole package, consider Toshiba's Qosmio line of massive desktop replacement PCs. They're hardly portable, but the Qosmios (or is that Qosmii for plural?) have consistently incorporated terrific audio into their designs. Forget the peripherals right now, though. 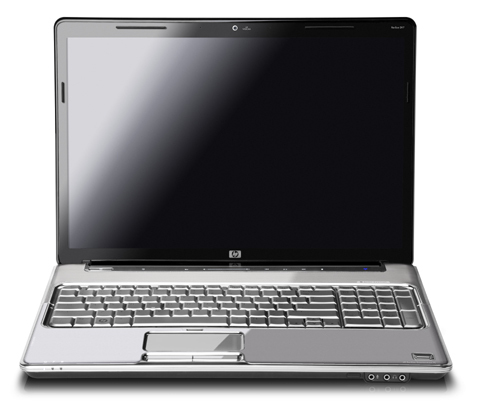 Without the docking station, the HP Pavilion dv7t slightly stumbles as an end-all, be-all entertainment unit. If you're looking for the whole package, consider Toshiba's Qosmio line of massive desktop replacement PCs. They're hardly portable, but the Qosmios (or is that Qosmii for plural?) have consistently incorporated terrific audio into their designs.